Posted on September 23, 2008 at 3:39 pm. I remember it was last year, 2007 when this blog was also a finalist in both awards division Philippine Blog Awards and Philippine Web Awards. Though I was happy I was in the finals before, I was a little disappointed when I didn’t bag the main awards. I know being a finalist is an honor in itself and not to mention the exposure (and traffic) it garnered, but I would be a hypocrite not to say that somehow even a bit of a hint, I also wanted to get those recognitions. Not only for the opportunities it can open but also as a self-fulfillment. There is always that tense and uneasy feeling of the unknown when you are part of that final-list. Try as I might not to think about it but it keeps dodging in which can be a bit frustrating. This year, 2008, I chose not to actively seek any award as I did last year. That’s why when PBA 2 was announced I took it lightly and just try to focus more on my travels and enriching this blog’s content. But when I got a nomination in the mail last August, I was a bit hesitant to accept it but still did so, thinking hey, let’s play around with this and just see where it goes. Win or not, it’s still an opportunity to reach more readers. 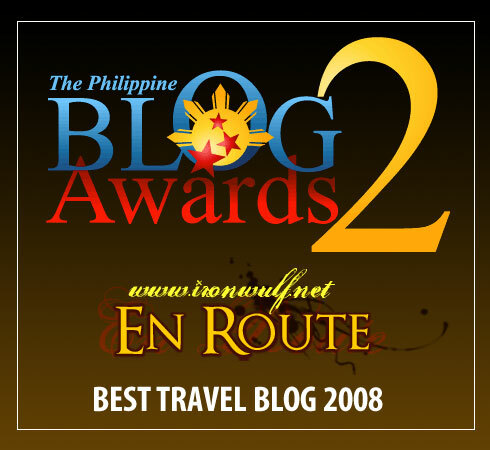 So last September 21, 2008, when the 2nd Philippine Blog Awards was held in One Esplanade it was a pleasant surprise to learn that I won the Best Travel Blog Awards. While I was not at the venue, I received some text messages that I got the Award and to add to that, I also won in the raffle for the Nokia N82 Cellphone. It’s really great to hear the news as I really am not expecting to get it anyhow with all the strong contenders with me. Well that being said and the awards given, my heartfelt thanks goes to the organizers, volunteers and judges of this years Philippine Blog Awards. I know the hard work and strenuous preparation you guys went through just to make this event a reality. Setting it up and pulling off this event is no joke so hats off to you guys. My sincerest thanks also to the person(s) who nominated for this blog to be included in the list. Had I not received a nomination I really wouldn’t be a part of this. Thank you for believing and the support. This award goes out to my blog readers and supporters as well for being there and supporting this blog all this time. My friends and travel buddies, my family who allows me to just wander off out of the blue and also to the local Philippine Blogging Community. And most of all to the person up there who seems to have been giving me enormous blessings so far this year. To end this long pseudo-speech MY DEEPEST GRATITUDE to all. 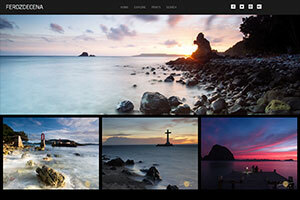 It’s a real inspiration to go on and share all these travel and images to show how amazing the world is. Many thanks and congratulations to the rest of the winners. a well-deserved blessings. congrats, Ferdz! it just proves that we always get the things that we desire given the right time and opportunity. gandang pa-berthday sa’yo ng award at ng N82 mo, hehe. i wish you more blessings and more awards. thank you for sharing your talent to us. cheers! blowout naman dyan, hehe. seems you dont need the N82 phone. fyi, i was ‘dis-phoned’ just this month when it was pickpocketed. can i ask for the phone? haha. joke lang. Blessings come in a way you least expect it. And its a good good feeling. way to go ferdz! Congratulations! congrats! your deserve it bro! i really thought you deserve the award wulfriend, among the many blessings you’ve been receiving. i’m green with envy, of course, but am very happy for you because of all the people i know, you really deserve each and every thing that comes your way. congrats ferdz! you really deserve it. hindi ko maisip na 2 years ako nagbabasa lang ako ng blog mo then this year nakilala ko kayo ni oggie, nakasama sa biahe at naging kaibigan. i am proud! continue to inspire us. Congratulations Ferdz! You definitely deserve this award for sure! there was never any doubt that your travel blog is leaps and bounds above the rest. it just needed time for the organizers to figure that out. luckily, they came to their senses soon enough. congratulations ferdz. may this push you to go out there more and bring us back more places to put in our very own wish list. cheers. Hi Rayts! I guess timing is everything din. Yup, still haven’t got the phone baka bukas pa. Many thanks Allan and Ronnie! Naku Amig-Og, in a way you have contributed here as well dahil madalas kitang kasama sa byahe so many thanks to you as well. Erick, maraming salamat! It’s also my pleasure to have you as a friend and travel companion as well. 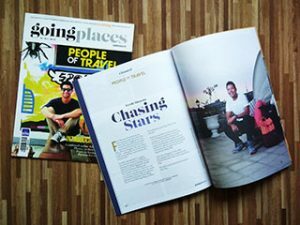 Dyanie, Traveler on foot! Many many thanks! Congrats Ferdz on this well-deserved award! Glad to hear from you Sidney! Yon naman tagala! wala talagang kakupas-kupas sa web awardssss-ah hehe! Congrats! Congratz Ferdz..talagang hindi kana matayug…….Blog celebrity kana ngaun………….as in. Congrats, Ferdz! You truly deserve this award. Last year, I thought you won.